Rivers:- Both the Eucumbene & Thredbo Rivers have had plenty of rainbows holding back after spawning since the opening.The average fish have been around the kilo mark with quite a few over 2kgs. We should still see quite a few of these fish stay on and provide some dry flyfishing once we get some stable warm weather and hatches.There have been reports of termites and dun's over the last week , so it should only be a matter of time. Jindabyne:- It's been a little patchy on Jindy over the last few weeks, with best area's being up around the Thredbo river mouth at around Waste Point and the eastern shoreline around Sid's Bay . 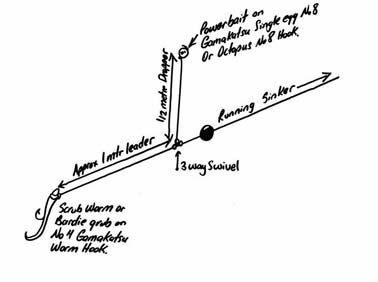 Fishing a mixture of small minnows like RMG Scorpions, Merlins & Attacks along with Tassies in "Yellow Wing" patterns should see a few nice fish in the boat. *Tony from Sydney with a lovely 2kg brown taken with a live spider mudeye out at Middling Bank on Eucumbene. The baitfishing has been great,with some fantastic browns starting to come in over the last few weeks. The best fishing has come with combining a scrub worm with a Power bait dropper ( pictured below).Power bait in orange, rainbow and lemon twist have been the main fish takers.This rig has really proven itself over the last few seasons, with both options you really have it covered.Power bait naturally floats, so the distance you make your dropper is the distance you can expect your Power bait to be above the bottom. This means that fish will find your bait a lot quicker even if you have cast into weeds. If they don't eat the Power bait they have found your main bait a lot quicker. The hook is important when fishing with Power bait and we get a special "single egg" pattern in from Gamakatsu just for the job - which has a short shank and ultra wide gape. Feel free to ask us to go over the rig next time your in if still unsure. We have also started to see a few fish coming in on mudeyes - and expect this to pick up as things continue warming up.